Visit Prince of Wales Northern Heritage Centre for more information on June Helm. June Helm was born on September 13, 1924 in Twin Falls, Idaho to Julia Frances (nee Dixon) and William Jennings Helm. Her family moved to Kansas City in 1930 where she attended public and high school. She graduated from high school in 1941 and attended the University of Kansas City until 1942 when she transferred to the University of Chicago. In 1945, Helm married Richard S. "Scotty" MacNeish, an archaeologist. In 1949, Helm and MacNeish moved to Ottawa where he held an appointment at the National Museum of Canada. During his summer archaeological survey of the Mackenzie River, MacNeish learned that the small community of Jean Marie River required volunteer teachers. 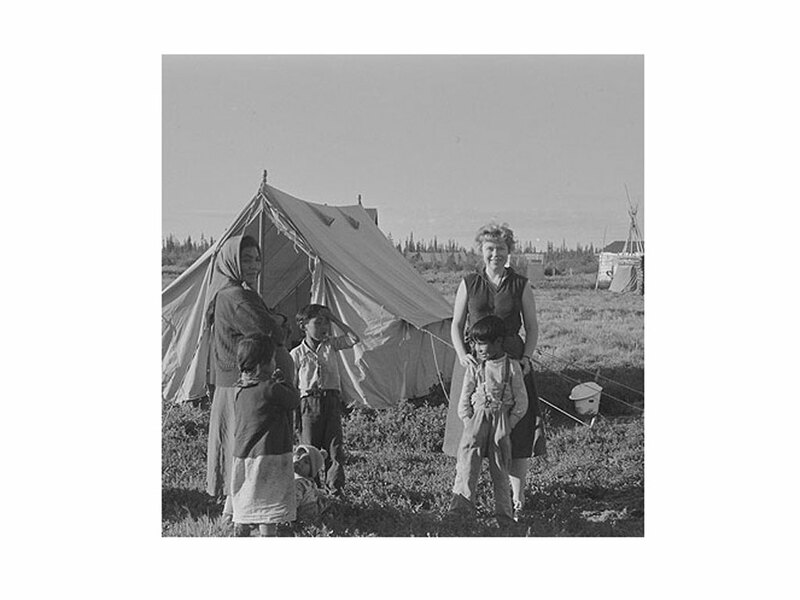 In the summer of 1951, June Helm and fellow graduate student, Teresa Carterette went to Jean Marie River as volunteer teachers, however, Helm also started to compile ethnographic field data at this time, which became the basis of her PhD dissertation. She received her PhD from the University of Chicago in 1958. In 1959, the Tlicho (Dogrib) people became the focus of Helm's fieldwork, which entailed ten trips to the Northwest Territories between 1959-1979. Ultimately, she edited the Subarctic Vol. 6 of the Handbook of North American Indians that was published by the Smithsonian Institute in 1981 and wrote several books, monographs, articles and chapters about her fieldwork in the Northwest Territories with the Dene. In the 1970s, she served as an expert witness and land claims researcher for the Indian Brotherhood (Dene First Nation), and as a consultant to the Mackenzie Valley Pipeline Enquiry. During the years that Helm lived in Canada, she was a sessional lecturer at Carleton University in Ottawa (1949-1959) and at the University of Manitoba (1953). After she and MacNeish divorced in 1958, she became a professor in the Department of Sociology and Anthropology of the University of Iowa in 1960. In 1968, she married architect Pierce King. In 1969, the University of Iowa established the Department of Anthropology, where Helm, at intervals, served as department chair. Between 1993-1996, she chaired the American Indian and Native Studies Program. She was also the president of the American Anthropological Association (1985-1987), served as editor of American Ethnological Society publications (1964-1968), was president of the Central States Anthropological Society (1970-1971), chaired Section H of the American Association for the Advancement of Science (1978), was associate editor of American Ethnologist (1979-1981) and was president of the American Ethnological Society (1982-1983). She was also elected a fellow of the American Academy of Arts and Sciences in 1994. June Helm was professor emerita at the University of Iowa, having retired in December 1999 after 40 years of teaching. June Helm died peacefully in her sleep on February 5, 2004.